Every week the mothers of hope village participate in our Family Coaching and Mentoring Classes. Each lesson is designed to help them bridge the gap between surviving to living healthy successful life as cohesive family. Currently, the mothers of Hope Village are on the Parenting and Financial Structures unit. 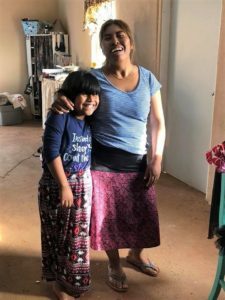 Edith Michaels our Family Life Coach in Baja shares below how the program is progressing and the amazing changes that our families are experiencing. In our parenting class, we have been teaching them about getting to the heart of the behavior of their children. Parenting is hard and parenting as a single parent is a very tough job. These moms have learned from their own parents, ways of handling children that they now recognize as not necessarily the best way to help their children. They are making great efforts to apply what they are learning. When Esmeralda came into Hope Village with her three children and was asked what her children liked, she said she didn’t know. The father of her children was using drugs and didn’t want the children around when he was home, which was most of the time. Esmeralda passively allowed the children to raise themselves so that there would be peace in the home. This didn’t work, as he was physically abusive to Esmeralda. Since she has been at Hope Village, we have seen her teaching her children how to read, playing with them, and taking walks with them. This willingness to grow is evidenced by the children being much more respectful, obedient and happy. The financial structure class has been showing them how to live within their means and to plan out how to use their finances. The first step is to pay off financial debts. The second step is for them to start saving to have an emergency fund then to plan for their future by saving to buy a property. Ever since we started the financial class, they have paid off their debts, they have saved up an emergency fund of 1000 pesos (about 55 dollars), and have been saving to begin paying for a property. Estela and Esmeralda have been working in the strawberry fields and right now is the season where they can make the most money. They have each put away enough to consider a down payment on a property. A down payment for a property would cost from 3000-6000 pesos (about $160 – $320 USD). This is a huge accomplishment considering they make about 200-300 pesos ($11 – $16 USD) a day. The mothers are also learning how to manage their money by budgeting their moneys, which include tithing, buying toiletries, and paying for daycare. They have been learning to plan their meals for a whole week at a time, as the next step will be to teach them to make better use of their money when shopping. The day after the first financial class, Erika realized that she forgot to pack mayonnaise to make sandwiches for the kids while at her beauty shop. She thought to herself, “If I go home, it will cost more in gas than if I walk to the store and get a small jar”. While at the store she saw some avocados and she really wanted one. The avocados were not in season, so they were three times the regular price. She realized that she didn’t need it and didn’t buy it. When she was back at the beauty shop, a gentleman walked in and told her that he had been working in the hills, picking avocados. He thought about her for some reason, and decided to bring her two. She was so giddy when she explained this to Edith. She stated, “God is so good! I wanted one avocado and God sent me two.” This may seem small, but for Erika, this was big. The process of becoming healthy in all these areas can be daunting. We are proud of the mother’s at Hope Village and all they have accomplished. Edith continues to work with the women on a weekly basis and will continue to keep you up to date with the progress of the Family Coaching Program. THANK YOU TO ALL OUR MONTHLY SUPPORTERS FOR BEING APART OF THE HOPE, AT HOPE VILLAGE. YOUR MONTHLY OR YEARLY GIFT IS GOING FAR TO MAKE A LASTING IMPACT FOR GENERATIONS TO COME.